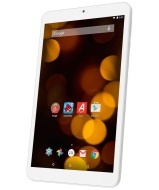 alaTest has collected and analyzed 259 reviews of Bush Spira B1 8 Inch 32GB Android Tablet - Silver. The average rating for this product is 4.5/5, compared to an average rating of 4.5/5 for other products in the same category for all reviews. People really like the screen and size. The performance and usability also get good feedback, but there are some negative reviews about the reliability. We analyzed user and expert ratings, product age and more factors. Compared to other products in the same category the Bush Spira B1 8 Inch 32GB Android Tablet - Silver is awarded an overall alaScore™ of 87/100 = Very good quality. Good performance and good value for the price but the sound quality is really bad. Without headphones the sound cant be heard, even on max volume. A good quality medium priced tablet with first class display. Battery life not brilliant, but well worth the price. Nice and sturdy too. Recommended. My Tablet isn't all that great.
" My 6 year old son bought this with is birthday money! It's fab, does everything we need! " " nice tablet easy to use and plenty of memory "